“Would you mind jumping in and reading the Tarot Card Reader’s line with these guys?” Director Alan Chebot asked the red-haired young lady behind the camera at our casting session. That question proved serendipitous. From over 25 women who came in to read, it was Courtland Jones, the assistant casting agent, who rose to the top as the obvious choice for our lead actress… and she wasn’t even there to audition! With casting complete, we had exactly three weeks from the day the elaborate concept was given the green light until delivery of an epic mini-movie. It was a Parallax land-speed record, so a little serendipity was welcome. Collaborating with agency Mechanica, we were excited to bring PTC’s vision of the future of products and manufacturing to life. The brainchild of Creative Directors Jim Garaventi and Ted Jendrysik, the concept centered on a business executive visiting an alluring fortune-teller to find out the “keys to the future”…But did he actually visit her? You be the judge. 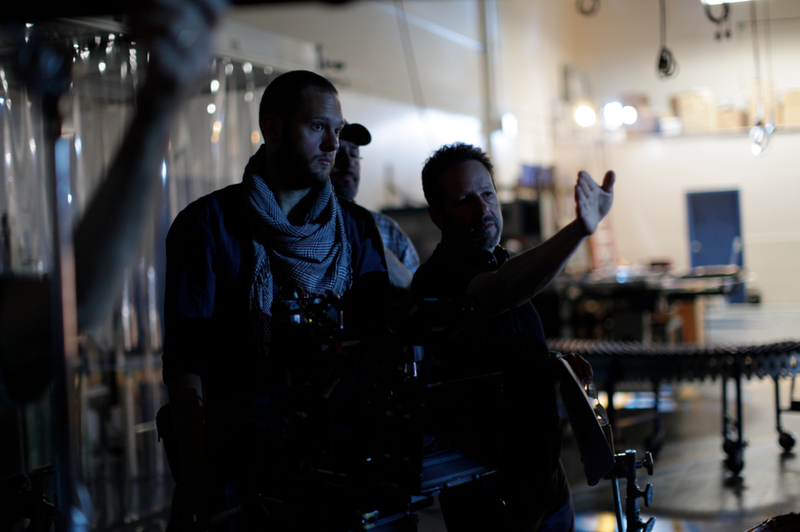 To give the piece a cinematic look, we chose the Red Epic Camera with our own Canon C300 as B-camera. Our Art Director was quickly combing shops for candelabras and woven tapestries to create the rich, layered look of a fortuneteller’s lair. Our Wardrobe Stylist was on the hunt for funky antique jewelry and gypsy garb. Three Location Scouts scoured the Boston area for manufacturing facilities open to the idea of a film crew invading their space. Everyone dove right in and did their part. And, voila! We were ready to roll by 6:00am on the first of two long days of filming. If you’ve ever been to the Commander’s Mansion in Watertown, you know any room there would make an ideal setting for a tarot card-reading session… and it did. Then, day two took the cast, crew and clients from a factory building in Mansfield up to PTC’s headquarters in Needham for the three remaining scenes. In each setting the original tarot card-reading table needed to be recreated…continuity was vital. In all, we moved the entire operation to five locations over two days, and each worked seamlessly with the vision. The stars just seemed to align. Courtland helped move things along by nailing her lines and hitting her mark on every take. She even threw the tarot cards down on the same spot, take after take, which thrilled our AC-focus-puller! The film was directed by Alan Chebot, and lensed by Director of Photography David Kruta. Rob Engel designed the set and Team Parallax’s Tara Haggett, and Taylor Wieluns produced. Upon wrap, we had the goods to take back to our editing suite at Parallax where Editor Cameron Femino put together an intriguing and beautiful piece. “See The Future” had its debut at PTC Live Global 2013 to rave reviews…and it all happened in three weeks! Watch the final "See the Future" spot below. Read the full article on the Parallax Blog here.